YOUR MAMAS NOTES: We can't fathom what kind of internet search hocus pocus Mister Big Time used to suss out exactly which Malee-boo manse Matthew McConaughey purchased based on the slim information provided by Miz Ruth Ryon in her recent Hot Properties column. But he never ceases to amaze Your Mama with his abilities. According to our well informed source, the perpetually shirtless stud, McConnaughey not Bit Time, did indeed purchase a property a few doors up from the Wildlife Road compound that was recently sold for a reported $38,000,000 by the widow of Johnny Carson. It's also just a few hundred yards as the crow flies from Malibu's high priestess Barbra Streisand's cliff side compound. Now children, just try to imagine that backyard bbq with Matthew doing some embarrassing hippy dance and Babs sucking on pork ribs whil James Brolin holds her unnaturally blond hair outta the sauce. Oh lawhdy, to be an ant on that picnic blanket. 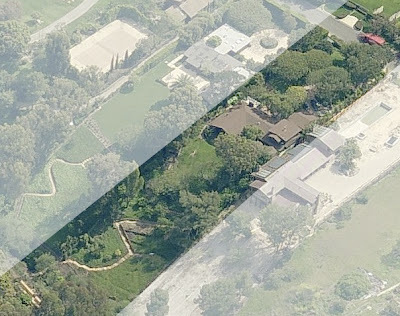 While Mister McConaughey's new and relatively modest Point Dume digs do not front the ocean, he can use his firm and well developed leg muscles to climb down into the hillside at the back of his property and hike through the canyon to the surf, surfboard strapped to his muscular and sweating back. No word on where he'll be parking his small fleet of Airstream trailers, but Your Mama imagines that his Brazilian model lady friend Camilla Alves is thrilled to be going home to an actual house rather than a trailer or a suped up trailer. I can't believe non-waterfront properties on Point Dume are going for $10 million. waterfront on point dume is $18M - $45M so it's not really surprising that this place is $10M, this place likely has beach rights though. You're totally right on all counts. I'm just amazed that Point Dume -- which used to be relatively cheap -- has gotten so expensive. phc everything is expensive that's why they want me out! don't know about "boy toy" but i was in line at the trancas starbucks & he definitely needed a good scrub under the arms! that is a lot of land, did sahara break his bank account ? maybe he was forced to live in the trailers until the movie broke even, and now that it is very profitable he is moving on up. He lives doors away from julia Roberts , Sean Penn and Barbs Streisand. Julia and Barbra live on the sea. He and Brad Pitt both never had good hygiene..but they are sho purdy to look at!! Matt had a custome Airstream built for me with a sling in the living room. If the trailer's a rockin, don't come a knockin. The economy might be edging toward a recession in the wake of mortgage-related credit woes plaguing the financial markets, bankers and analysts said on Monday. something is wrong here, asking prices for ocean front estates in hawaii are a half to a third less than the ocean front estates in malibu. I saw Matthew Mcconaughey running today. I live on Cliffside at Point Dume and I've never seen him before. He lives on Wildlife Rd right?